New RCM Theory Syllabus? Don't Panic! UMT Has You Covered! If you are a Royal Conservatory of Music Curriculum Teacher, then you've probably seen the ads: the RCM is coming out with a new RCM Theory Syllabus. It was supposed to be out last May, but it kept getting pushed back. Now, it should be out in mid-August with an effective date of September 1, 2016. I can't tell you the number of emails and messages I've received from teachers who are confused as to how to plan their lessons for September or how to teach the new requirements. Don't Panic! Here at Ultimate Music Theory, we've got you covered! The RCM has stated that there will be a one-year crossover period from September 1, 2016 to August 31, 2017. Theory examinations written in the Winter (December, 2016), Spring (May, 2017) and Summer (August, 2017) sessions will include alternate questions to accommodate students who have prepared using either the 2009 or the 2016 Syllabus. Counterpoint examinations will only be offered in the Winter (December, 2016) exam session and then will be eliminated. The RCM is updating the History Books too - and that should be done by December (maybe). Because the RCM 2016 Theory Syllabus is still not available, we cannot tell you exactly what the new requirements will be for every new Theory Level. However, don't panic! We have a plan! 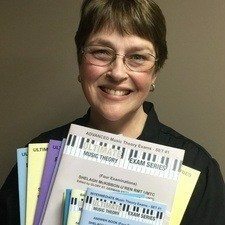 All YOU need to do is teach Ultimate Music Theory this coming year just as you have taught for the past several years. Remember - your students WILL be able to prepare for the Winter, Spring and Summer Theory Exam Sessions using the "old" RCM Theory Syllabus. This is a full-year cross-over period! You will be able to prepare for their Preparatory, Basic, Intermediate and Advanced Theory Examinations using your UMT Workbooks and your UMT Exam Series. You will not have to worry about teaching your students any new concepts or requirements. As soon as the new Theory Syllabus is available, Glory and I will start work on preparing everything that you need to continue to use the Ultimate Music Theory Prep 1, Prep 2, Basic, Intermediate, Advance and Complete Workbooks while meeting the requirements of the new Theory Syllabus. Here at Ultimate Music Theory, we are committed to NEPD - Never Ending Professional Development. We are here for you - the Teacher. We are here to help you learn, to help you support your students and to help you grow as a Teacher. Create new worksheets to correspond to any new Theory Syllabus Requirements! Create new Webinars to teach you how to teach any new Theory Syllabus Requirements! Support you to ensure that you can teach the new Theory Syllabus Requirements! When the Crossover Period ends, YOU will be ready to rock the new Theory Syllabus Requirements! And while you are waiting, please check out our UMT Online Courses and start your NEPD Journey Now! In the new RCM Piano Syllabus, the "Grades" were changed to "Levels". In the new Theory Syllabus, there will now be 10 "Levels" of theory that match the new piano levels. For example, Level 1 Piano will have matching Level 1 Theory Requirements, Level 2 Piano will have matching Level 2 Theory Requirements, etc. It sounds complicated, but it isn't. Introducing Theory from DAY #1 has been one of Ultimate Music Theory's goals for years! That is why we wrote the Ultimate Music Theory Prep 1 and Prep 2 Workbooks. Now, finally, the RCM is agreeing that Level 1 Piano (the old Grade 1 Piano) should have matching Level 1 Theory Requirements! Level 8 Theory (the old Advanced Rudiments). authentic cadence instead of perfect cadence and half cadence instead of imperfect cadence (we already show this terminology in our Theory Workbooks). The RCM has stated that there is considerable overlap between the requirements in the 2009 Theory Syllabus and the 2016 Edition Theory Syllabus. One notable requirement will be the reintroduction of Melody Writing. For those of you who have taught Theory since the age of dinosaurs - like me - you will be familiar with this concept as it was an old requirement. It is also a requirement of other Programs like Conservatory Canada. Again - don't panic! Here at UMT, we've got you covered! Over the course of this next teaching year (September, 2016 to August, 2017), we will provide you with the resources to teach all the new requirements! 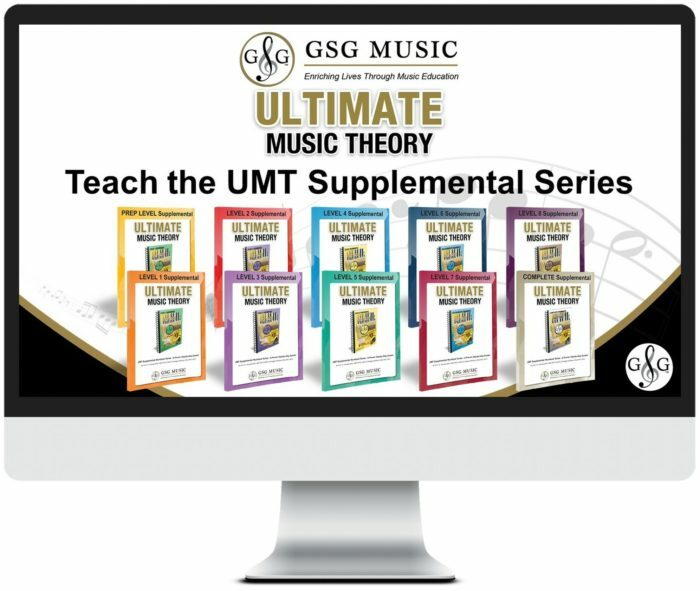 Teach your students using the Ultimate Music Theory Workbooks! Start your students in the Ultimate Music Theory Prep 1 Rudiments Workbook with their RCM Level 1 Piano! Prepare your students for the Preparatory, Basic, Intermediate and Advanced Examinations for the next Winter, Spring and Summer 2016-2017 RCM Exam Session! 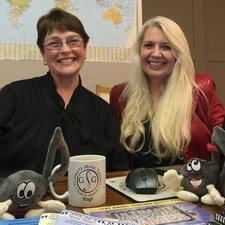 Check your email for upcoming Webinars and Worksheets! Glory and I look forward to working with you as we continue to grow as Teachers, Educators and Musicians! This is going to be an exciting year! Students in Levels 1, 2 or 3 Piano should start with the UMT Prep 1 Rudiments (followed by the Prep 2 Workbook, then the Basic Workbook). Students in Levels 4 or 5 Piano should start with the UMT Basic Workbook. Students who have completed any level of RCM Theory Examination using any other theory program can start in their next level with the corresponding Ultimate Music Theory Workbook! Joe comes for private piano from 4:00 – 4:45. He stays for “shared theory” from 4:45 – 5:15. Sue comes for shared theory (with Joe) from 4:45 – 5:15, and then stays for private piano from 5:15 to 6:00. Students are charged for their private 45 minute piano lesson. Then they “share” the cost of the 30 minute “theory club”. Perhaps this might work with you since your parents would not need to bring their child twice for lessons. It is also OK for students to be in different levels of the theory too. Hope that this inspires you! 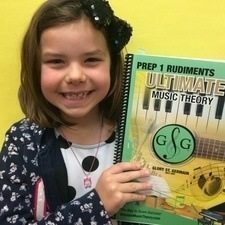 Young beginners (ages 5-8) start in Ultimate Music Theory Prep 1 Rudiments Workbook when they start Piano Adventures Level 1. The absolute JOY of Ultimate Music Theory is that it compliments any and every Method Series out there. It fills in the blanks for learning and provides that theory foundation that is missing from the Method Books. You start assigning ONE or TWO pages at each lesson and it is easily done in 30 minutes. Now – as soon as my students start in Piano Adventures Level 1, they must have a 45 minute lesson. Why? Simply because I cannot do my job as a teacher in 30 minutes. If their Swim Coach said they needed a longer swim class, or if their Skating Coach said they needed a longer skating lesson because they had advanced to the next level, guess what? Parents would do it. As a teacher, it is important that you stand up for yourself. When parents sign their children up for lessons with me, they are provided with a chart of required lesson times. If they only want a 30 minute lesson for the rest of their child’s music journey, then I simply am not the right teacher for them. I don’t make it an option. We need that lesson time in order to cover all requirements. Just remember – by adding Ultimate Music Theory Prep 1 Rudiments at the very beginning of the music journey, and by assigning one or two pages a week, your student CAN fit theory into their lesson time easily. If you wait until the student is in Piano Adventures Level 2 (for example), you will need to cram too much theory into one tiny lesson and a separate theory club group class would be your best fit (if the parent refuses to increase the lesson time!). I hope that this gives you something to think about. Remember that you are an AWESOME teacher and YOU are the one who gets to tell the parent what their child needs. I think that its great that you are giving some advice on how to transition from the old RCM theory syllabus to the new one, but you are only considering piano teachers. I’m a guitar teacher, and it would be nice to have some mention of guitar students from time to time in your newsletters. Thanks so much for your comments Paul. Yes, I do tend to focus on “piano” teachers as that is where most of my questions come from. I would LOVE to hear from more Guitar Teachers as to what works for them! If you have a favorite method book, and you have questions as to how to fit your Ultimate Music Theory into your teaching, PLEASE let me know! One of our Ultimate Music Theory Certified Teachers teaches guitar with Ultimate Music Theory very very successfully! So – please let me know how I can support you in a blog! I’d like to ask you if you have Harmony ( all levels) books and Harmony answers Books?